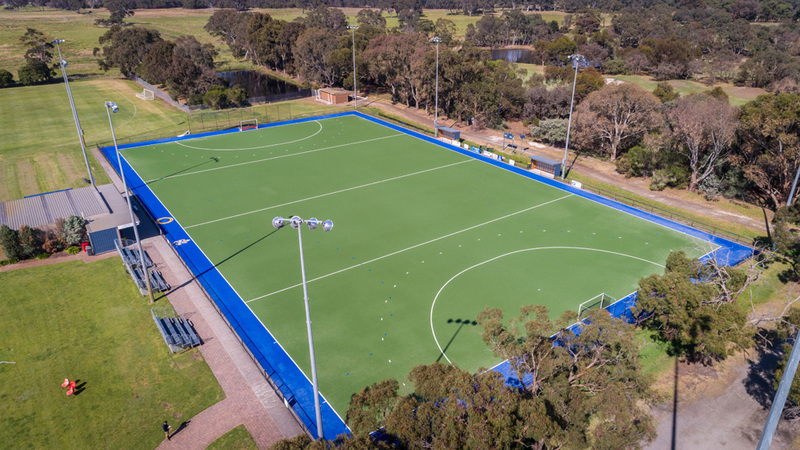 The Hockey Pitch at the Keysborough Playing Fields of Mentone Grammar is available to hire for training, matches or tournaments. The facility is managed by the Mentone Hockey Centre Inc. The playing surface is the latest technology all weather synthetic hybrid turf surface. The hybrid surface provides high level player comfort and safety. Facilities available include twin male and twin female change rooms with toilets and showers and large player shelters (with power and lights). Eight towers, supporting 4 lamps on each, provide superior lighting. The pitch is rated at 330 lux across the entire ground giving optimum visibility for late afternoon and evening usage. For special events, a booking request can also include a request to have the kiosk open (minimum numbers and booking times apply). Groups need to supply their own equipment such as balls, sticks, training cones etc. sent via text message to 0418 546 968 otherwise the booking rate will be charged.